I have an issue of a great deal of german cockroaches infesting my poor crab tank. What is the best way to get rid of them without harming the crabs? I don't believe I can do a deep clean, as I have several crabs down molting. Is there any crab-safe pesticide? Insecticides will affect hermits, too. Not that I normally like WikiHow, but method two on this page is crab safe and I can attest to it working very well for catching roaches without harming other tank inhabitants. (I can't find the original paper that mentioned it.) It will take a few nights but so long as there aren't other food sources, the roaches will swarm it. To keep them out of the tank until the infestation in the house is dealt with, a thick ring of vaseline around the outside of the tank will keep them from climbing in. Make sure to also ring any cords that lead onto or into the tank! Now, you say it works as long as there aren't other food sources, but: they have access to the crabs' food. Would I need to fast the crabs for a couple days, or is there a way to keep the roaches away from their food? Is there a crab-safe food the roaches may not be interested in? I would feed the crabs during the day, and then before it gets dark and the roaches come out, put the jar trap in and remove the crab's food bowls. Roaches eat the glue and paper on drywall, I'm not sure there is anything they don't like! I used fish flakes to lure them and within four days cleaned the tank. I would prefer not to do that, most of my crabs don't really come out during the day. But I will see what I can do. 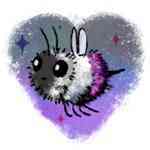 trashbees wrote: I would prefer not to do that, most of my crabs don't really come out during the day. But I will see what I can do. Unfortunately if they are in your tank, they are also in your home. German cockroach infestations necessitate extreme entomological warfare to remove, and if they are present at a level where you see them actively moving around your home, then there are thousands in the walls. 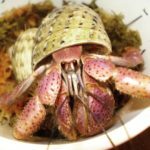 Your crabs will survive not having food at night; they graze and pick at organic items in the tank to eat in addition to their food and they will not starve in the short period of time it will take to remove the roaches. You want to also try and be sure that all egg cases and teeny babies are out. German roaches can affect allergies and asthma as well, so it’s best to treat the entire home.